In occupational settings workers are often exposed to pesticides at relatively high doses compared to environmental exposures. Long-term exposure to pesticides has been associated with numerous adverse health effects in epidemiological studies, and oxidative stress is often claimed as one of the underlying mechanisms. In fact, different pesticides have been reported to induce oxidative stress due to the generation of free radicals and/or alteration in antioxidant defense enzymes. The present study examined greenhouse workers regularly exposed to diverse pesticides under integrated production system, and a group of controls of the same geographic area without any chemical exposure. Two different periods of the same crop season were assessed, one of high exposure (with greater use of pesticides) and other of low exposure (in which a less use of these compounds was made). Non-specific biomarkers of oxidative stress, e.g. thiobarbituric acid reactive substances (TBARS), ferric reducing ability of serum (FRAS), total thiol groups (SHT), gamma-glutamyl transpeptidase (GGT) and paraoxonase-1 (PON1) were measured in serum samples from all study subjects, alongside erythrocyte acetylcholinesterase (AChE). 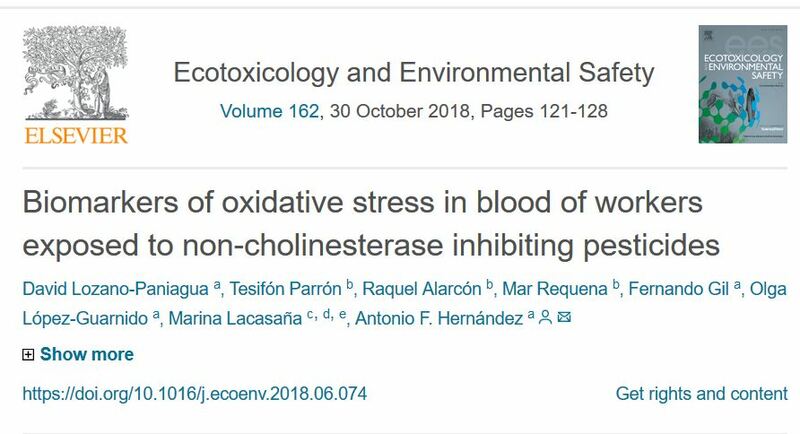 Results are suggestive of a mild increase in oxidative stress associated with pesticide exposure, which was compensated by an adaptive response to raise the antioxidant defenses and thus counter the detrimental effects of sustained oxidative stress. This response led to significantly increased levels of FRAS, SHT and PON1 in greenhouse workers relative to controls. Furthermore, AChE was decreased likely as a result of oxidative stress as workers did not use organophosphate insecticides.